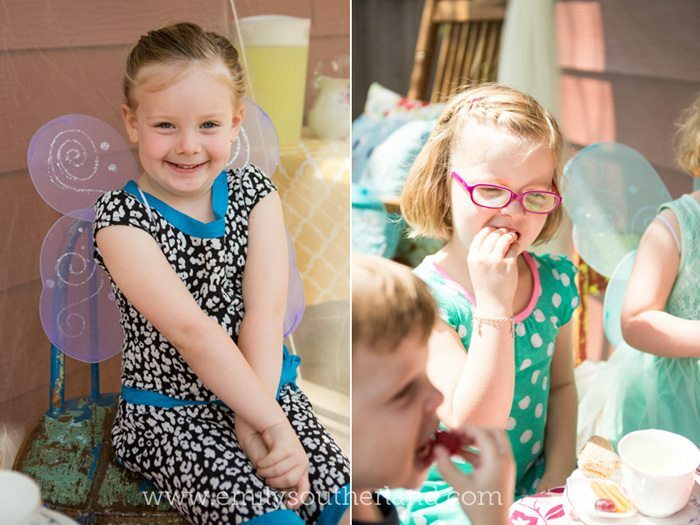 For my daughter Lucy’s fourth birthday, I decided to go with her current love of butterflies and do a sweet, girly, butterfly-winged / fairy tea party for her and a few little friends. 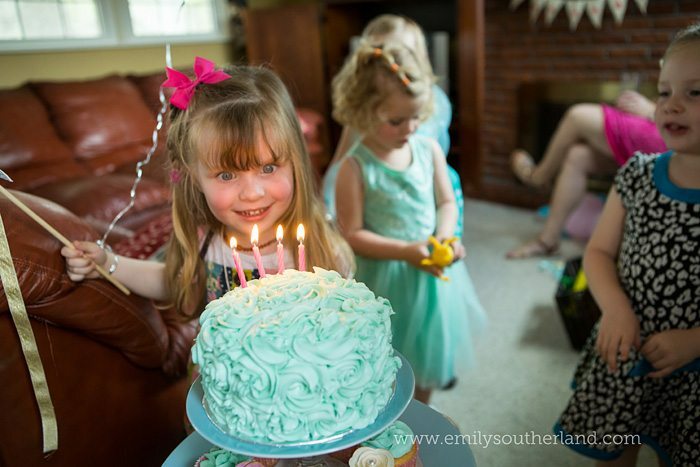 She’s not super demanding or opinionated, so giving her a party she enjoys is easy… And because she’s more of an introvert than an extrovert, it always seems to work out better to keep the party small. Plus, HOT TIP: the less kids you invite, the more you can DO when it comes to favors or activities, etc. It’s just easier to do big, fun things with fewer kids around. 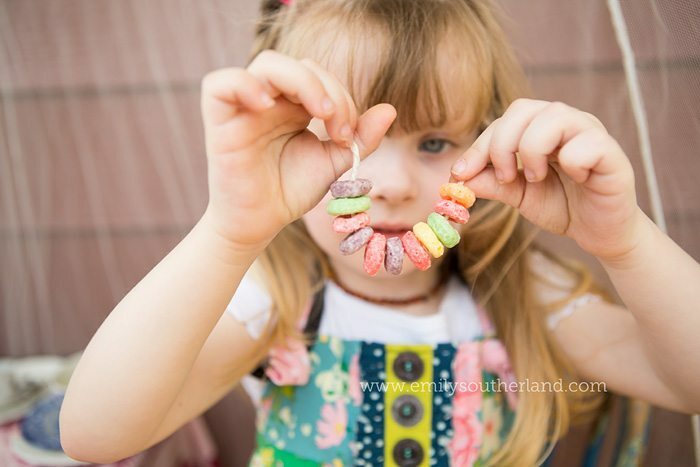 For Lucy’s party this time, I decided to try to use things I already had, or could gather or make for not much money. 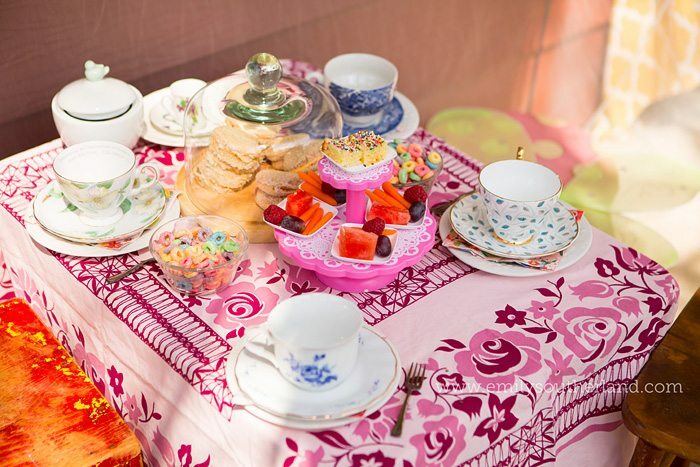 I think that a small tea party doesn’t need to be elaborate or expensive, though heaven knows I saw some pretty amazing ideas I’d love to try someday on another tea party maybe. 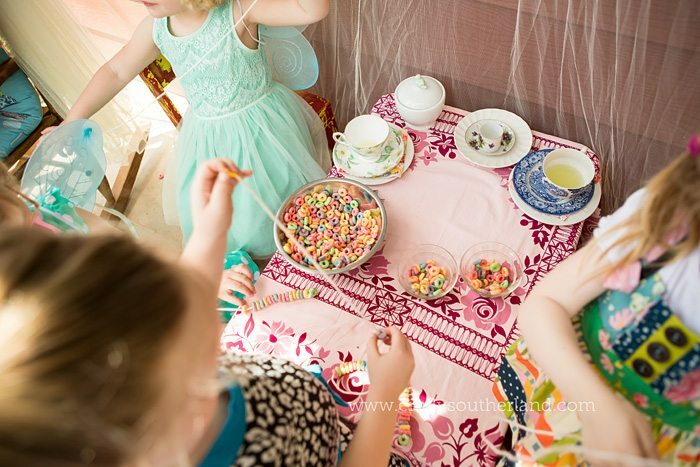 But for this day, it was just about making a sweet little spot for 4 sweet girls to nibble silly snacks that 4-year olds would want to nibble. 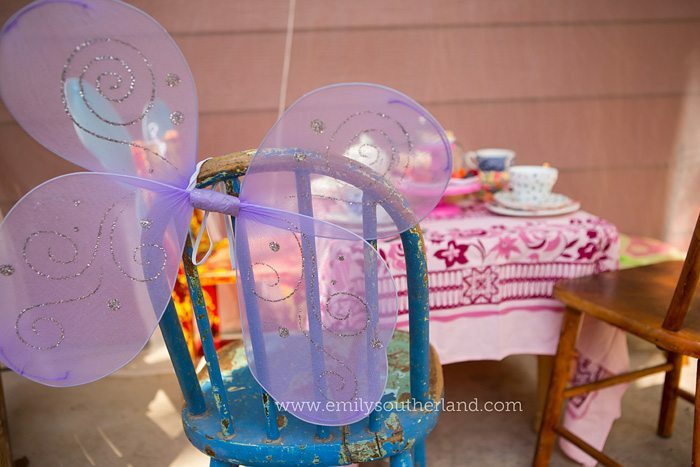 I had the little chairs and stools already, from years of collecting them for my photography business. I also used to collect tea cups, so I was covered there as well. 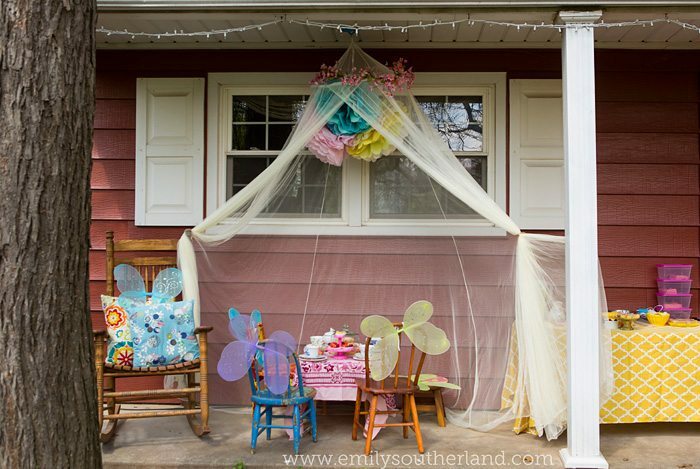 I bought the mosquito net canopy for this party ($20), and found a little table for the girls to sit at at my neighborhood thrift store ($5). 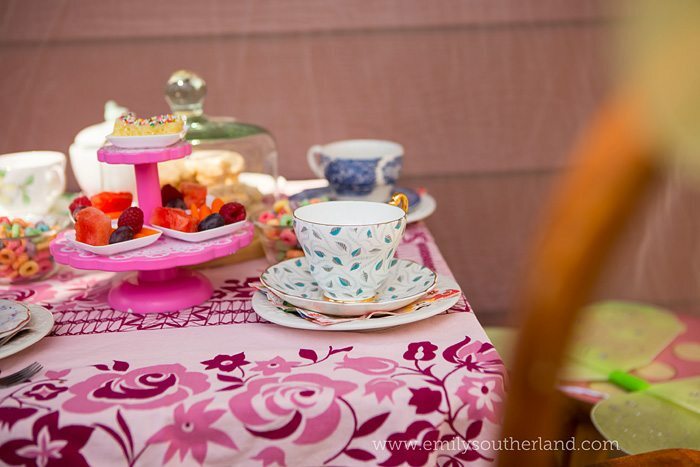 The vintage tablecloth was a gift from a friend years ago. The various plates, cake stands, etc. are ones I already had. 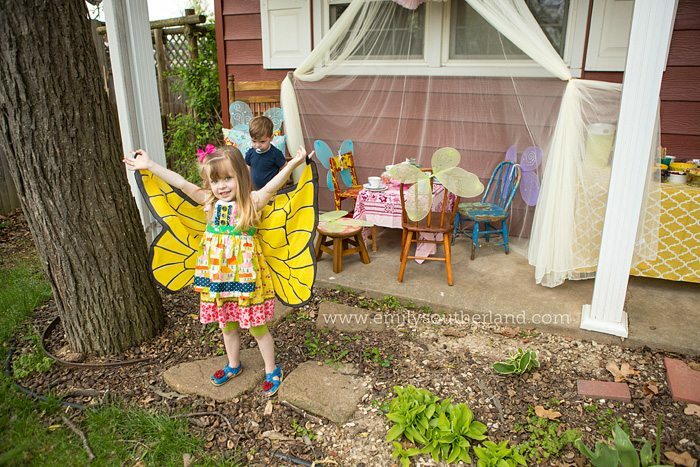 I added some dollar store fairy wings to each seat for the little ladies to wear/keep if they wanted to. 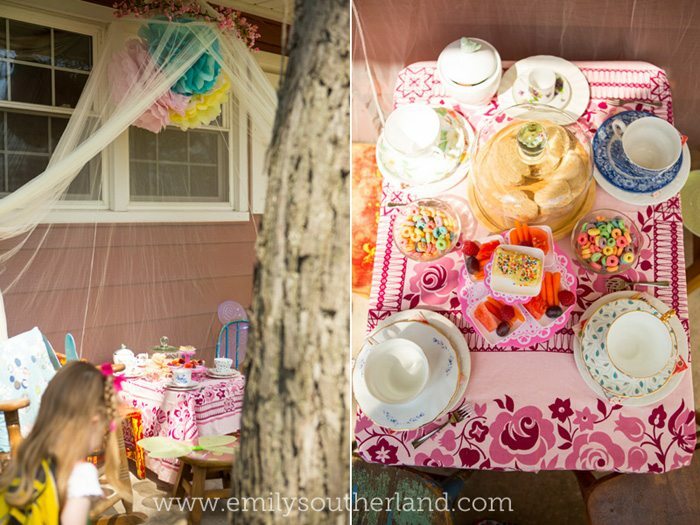 For the canopy, I made some tissue paper pom poms and strung a faux-flower garland. I brought my living room throw pillows outside to spruce up my porch chairs. 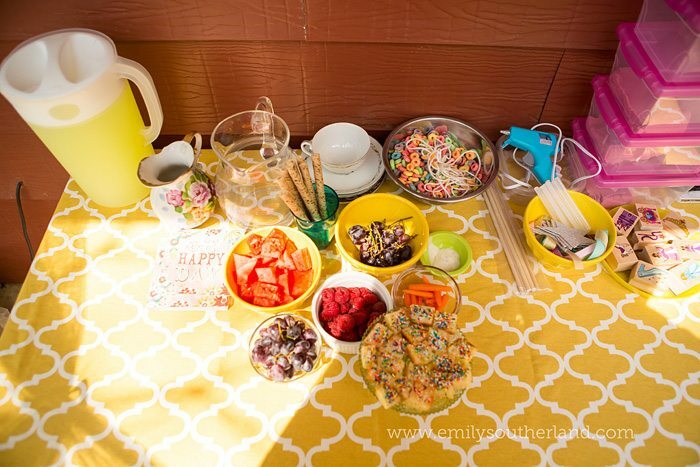 This side table was for holding the food that couldn’t fit on the tiny tea party table, and for holding the supplies for various crafts/activities I had lined up for the party. It’s not pretty, I guess, but it really helped me keep the party running smoothly to have this right next to the action. 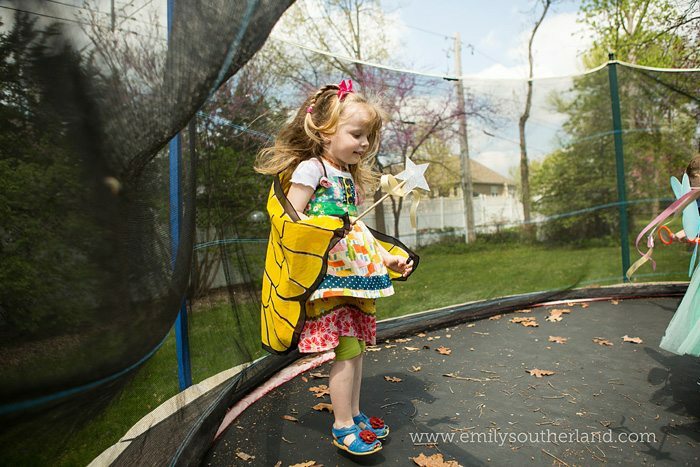 Lucy had just received a darling butterfly costume birthday gift from her aunt the day before, so it ended up being a big part of her party outfit on this day. 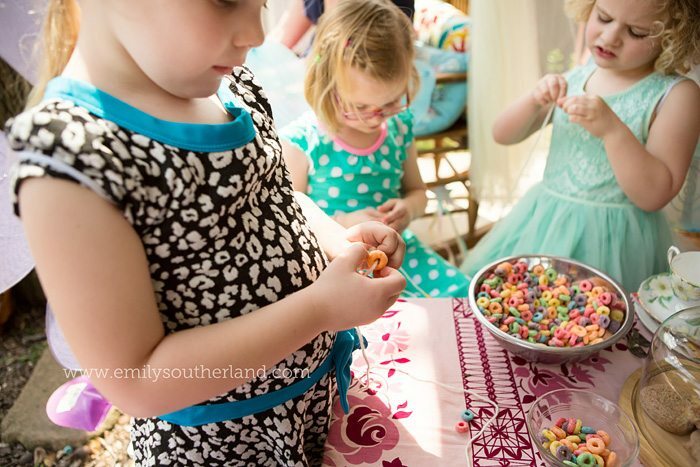 How sweet are Lucy’s party guests? 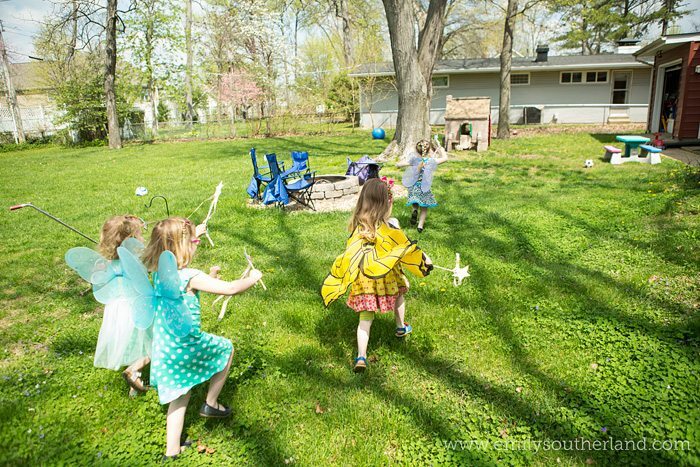 I invited them to wear a dress or skirt if they wanted, but made sure the mamas knew that play clothes were fine, too, since the girls might have a chance to run around and jump on the trampoline, etc. We started the party with food right away. That left time to play and have cake afterwards. 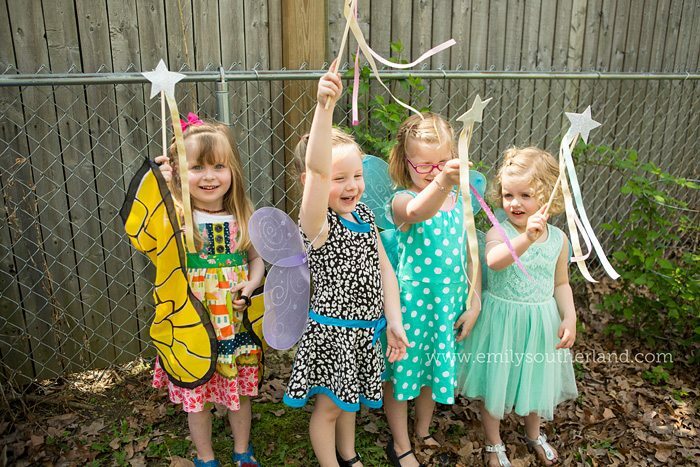 The first post-food activity was to have them design their own wand, then I glued them together for them. (Again– SO easy with just four guests!) I had pre-cut all the parts and had it all ready to just have them pick while I hot-glued. Fast and cute! 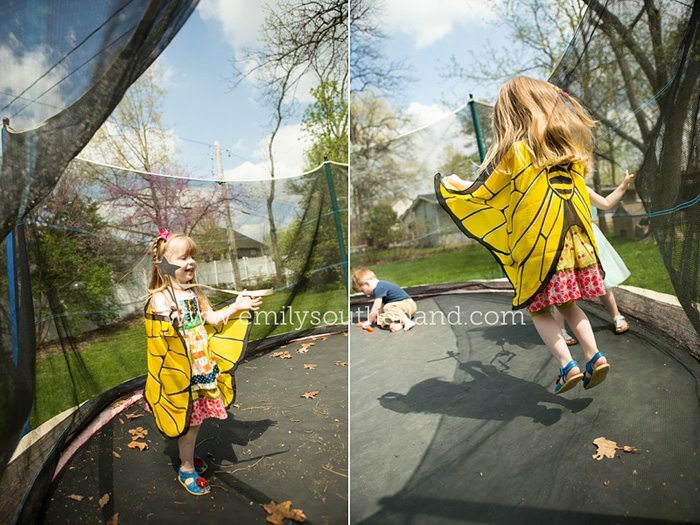 The ladies then took advantage of our roomy backyard and flitted around with their wings and wands, jumping on the trampoline and playing in the little playhouse for awhile. 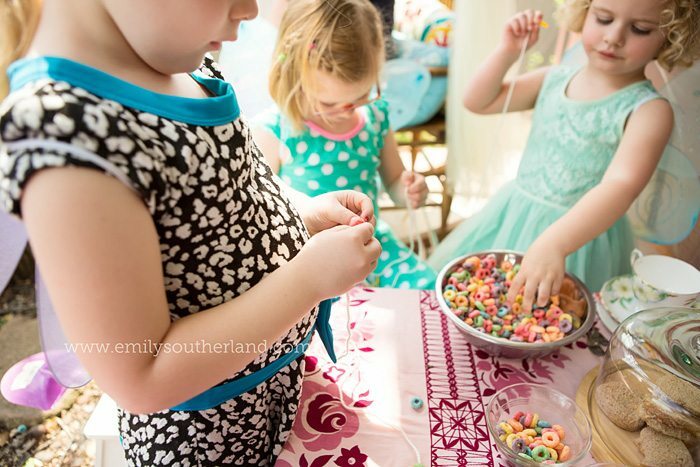 After some playtime, the girls expressed interest in making the fruit loop necklaces I’d told them about earlier, so back to their tea table, now mostly cleared off, to string fruit loops onto yarn. After necklaces got made (then eaten), we did a couple of presents and had some cake. 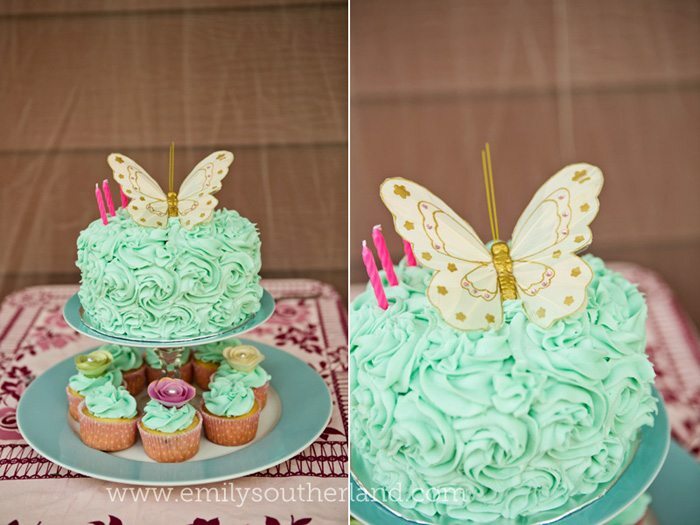 For Lucy’s cake, I went with the easy-but-dramatic rosette cake style. Seriously. YOU COULD DO THIS. This is a good tutorial. 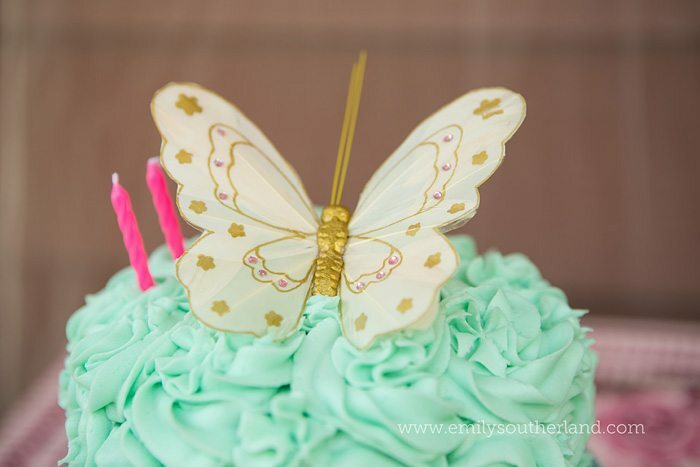 I found the sweet butterfly to put on the top of the cake in the dollar bins at Michaels. 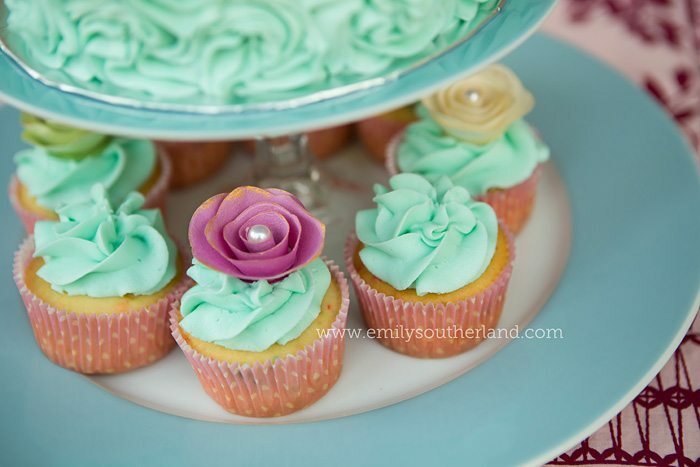 I also found the pretty paper roses that I used on top of the cupcakes in those magical dollar bins. 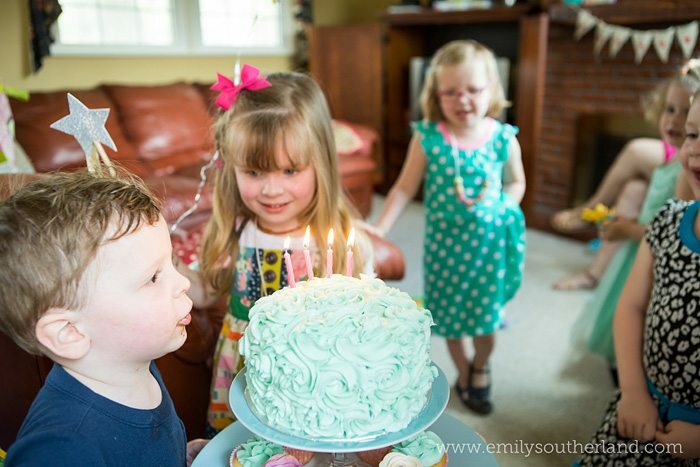 Quinn is an EXPERT at singing “Happy Birthday” and attempting to blow out candles, so I had to referee Lucy’s candle-moment very closely so he didn’t ruin her moment. Ha ha! But we managed! 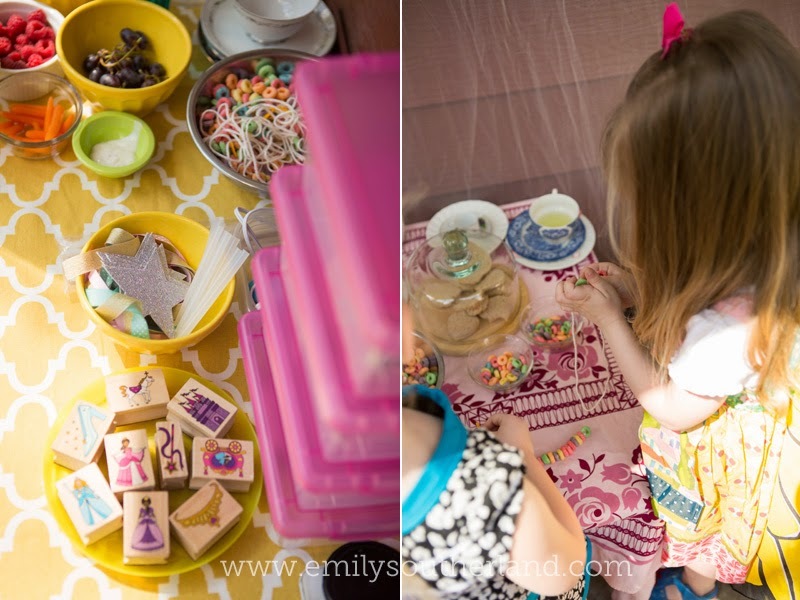 Finally, at this point, with all children feeling sugared out and getting close to naptimes, we finished the party with some kinetic sand and stamps. 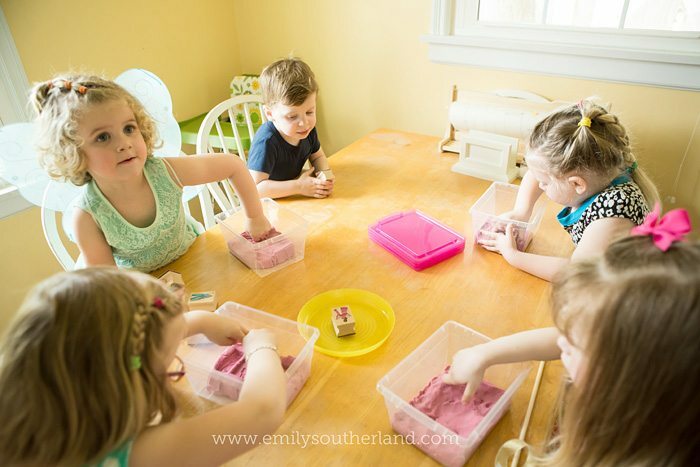 I’d decided that the main favor for Lucy’s guests would be a little tub of pink sand, since the store FiveBelow sells 1/2lb boxes of the stuff for $5. I feel like favors that will actually get used and enjoyed are worth a couple of $$ more, and again, THREE GUESTS means better favors are possible. 🙂 Lucy had gotten the princess stamps for her birthday the week before, so I pulled them out and set them on a plate for the girls to share and use in their sand. 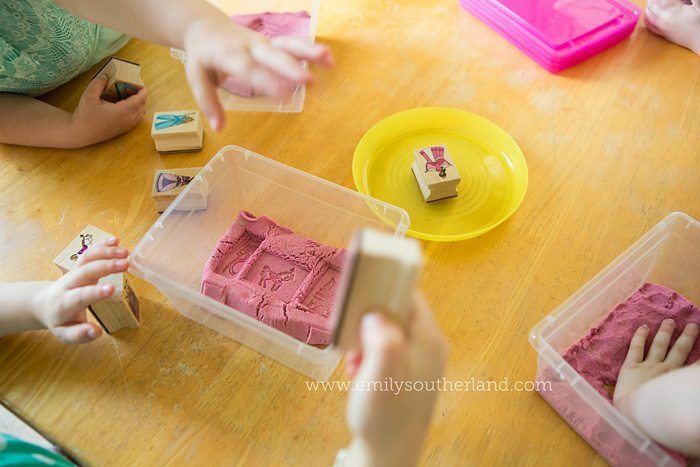 Seriously— rubber stamps and kinetic sand is such a cute and easy toddler activity for ANYtime. Try it sometime! It doesn’t hurt the stamps at all, and the sand holds the imprint so well! So by the time our little party wound to a close and Lucy got to a meltdown point, (no really, she did), the sand activity ended up being a good way to keep it mellow and keep them contained as we waited for parents. 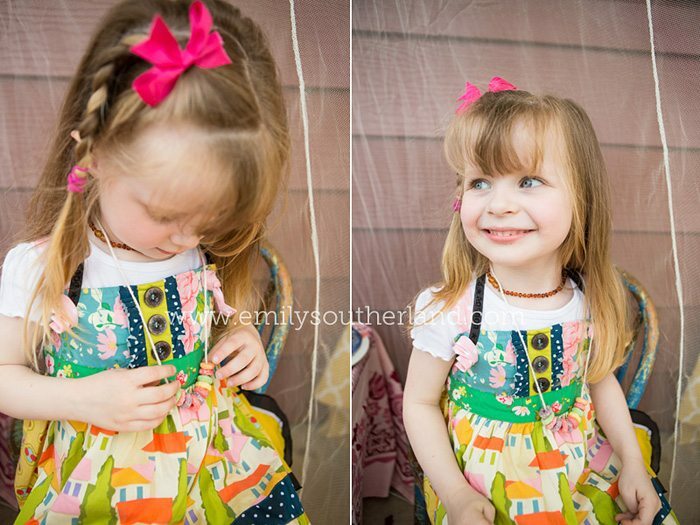 Lucy ended up too meltdown-y to say a proper goodbye to her guests, *sigh*, but the party really was so cute, and both Lucy and Quinn enjoyed themselves 95% of the time. 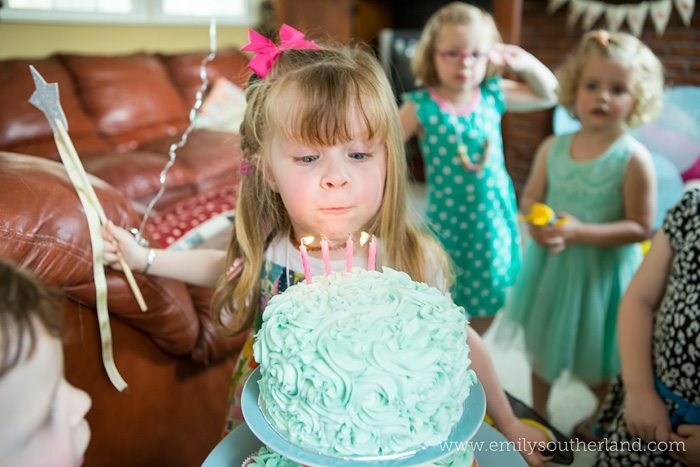 We do parties every other year, so it will be fun to see what a more grown-up and opinionated 6-year-old Lucy wants for her next party. 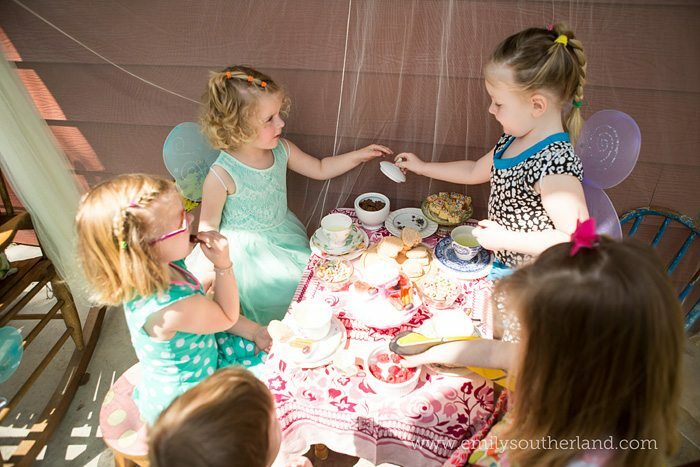 For now, this tiny little vintage/fairy tea party was a sweet way to celebrate my now-4 year old girl. 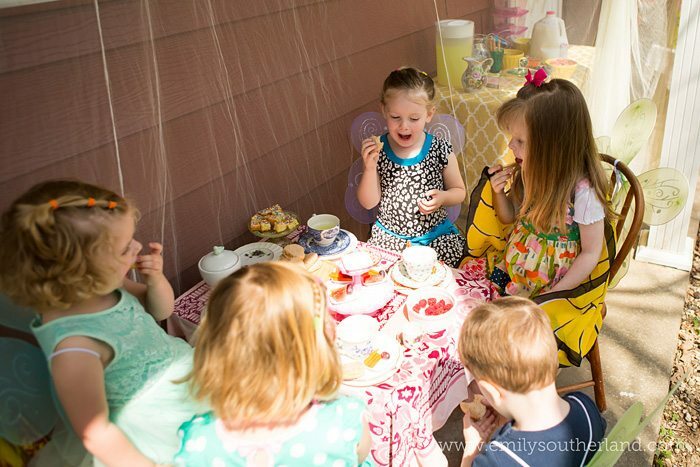 What a precious tea party for your lucky little girl and her friends. Never thought to use 6 inch pans for a smaller cake and cupcakes. 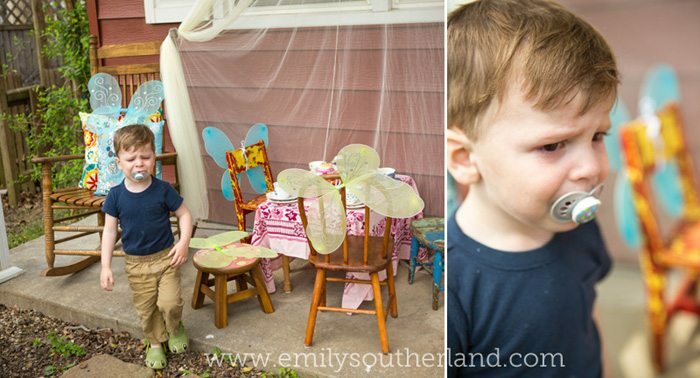 I plan to do that soon with my 4 year old granddaughter. Thanks for the idea. 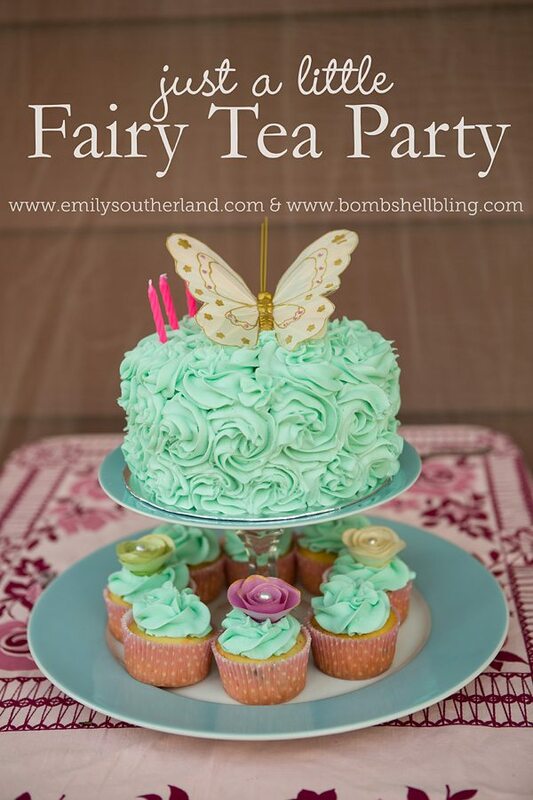 WHat an amazing party for little girls, especially when it involves tea and fairies!!! 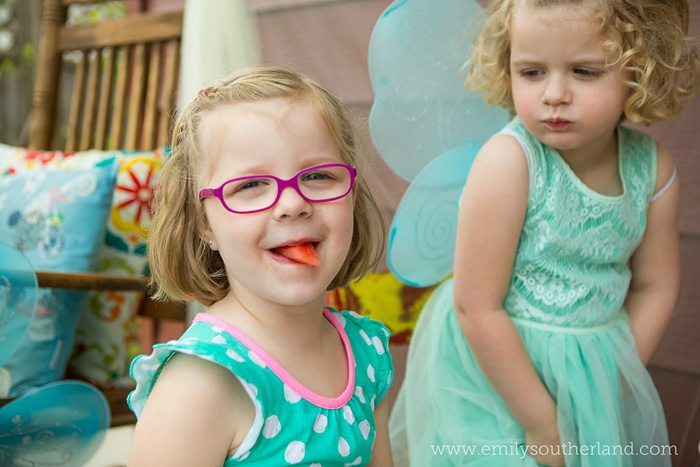 Thank you for stopping by Oh My Heartsie Girls Friday Features to share, I will be waiting next week to see what you have to share!! These are so cute! 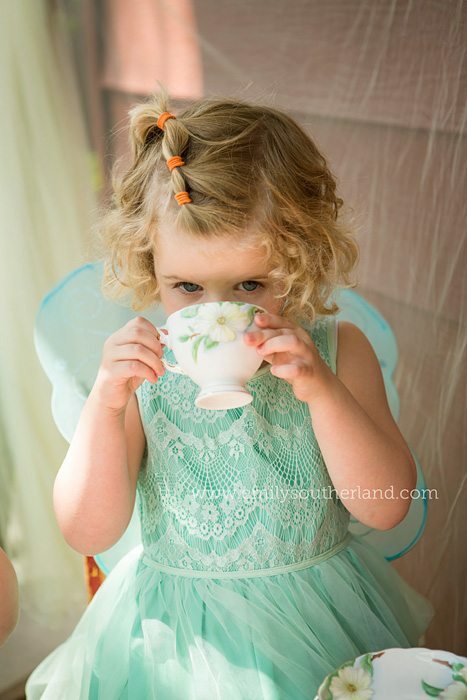 My daughter would love a fairy tea party. I love the sand activity to help calm them down. 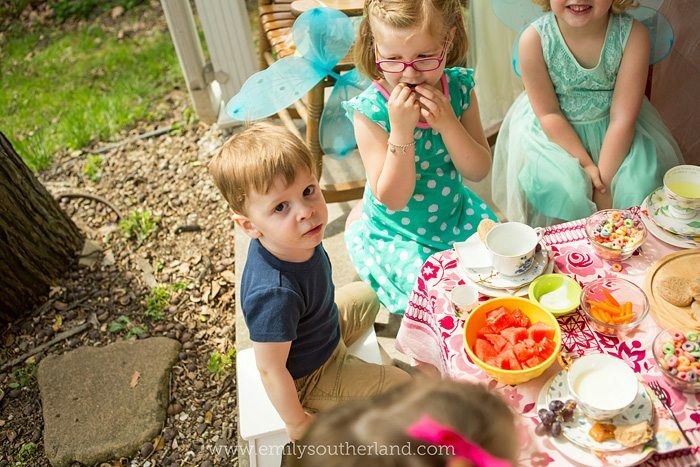 My three-year-old was overwhelmed at her party too and said her friends were annoying her and she wanted them to go home. 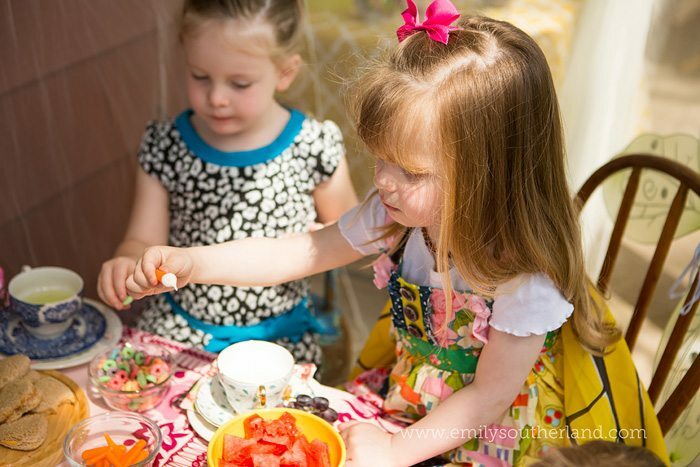 Every little girl should have a tea party. I love this idea. 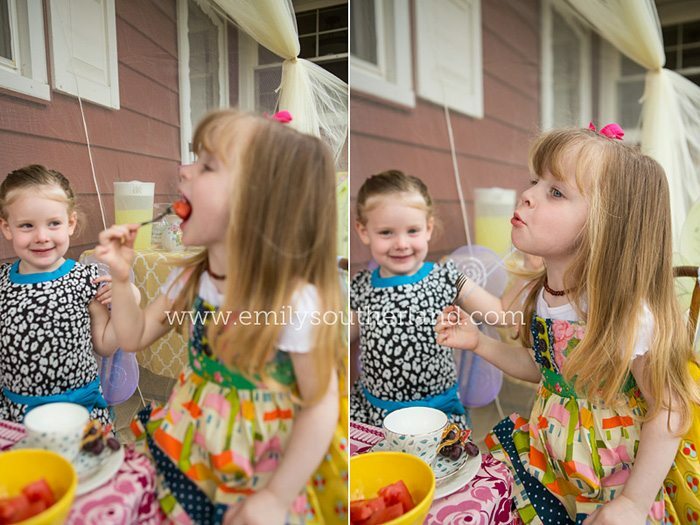 Thanks for the inspiration and sharing on Sunday’s Best Linkup. I’m looking forward to seeing more of your posts. Hi Sarah, I just wanted to stop by and let you know that your post has been chosen by one of our hostesses to be one of our features this week on #OMHGWW and will be in a Slideshow and is on Youtube. 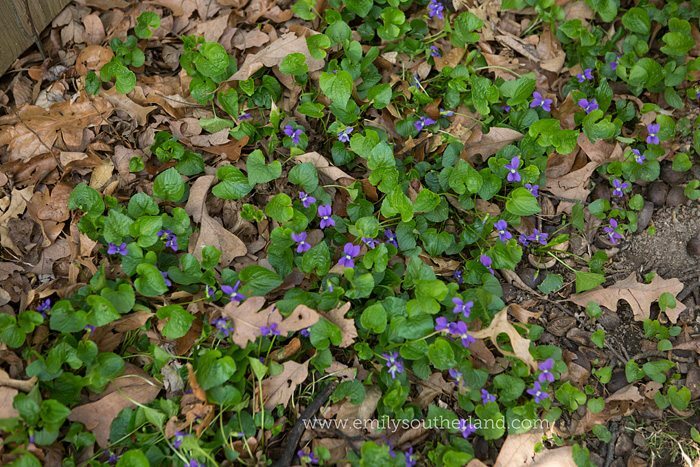 Stop by and linkup again this week. Do you think my 14 year let me throw her one?? Can I shrink her??Adorable! !Thanks for sharing at the Inspiration Spotlight party. Pinned & shared.